All praise is due to Allah and may His choicest salutations continue to descend upon our Master and Leader of the worlds. The 2019 South African National and Provincial Elections will be held in the month of May to elect a new National Assembly as well as new provincial legislatures in each province. According to the Independent Electoral Commission (IEC), the exact date is expected to be announced in due course. It will be the sixth election held since 1994. 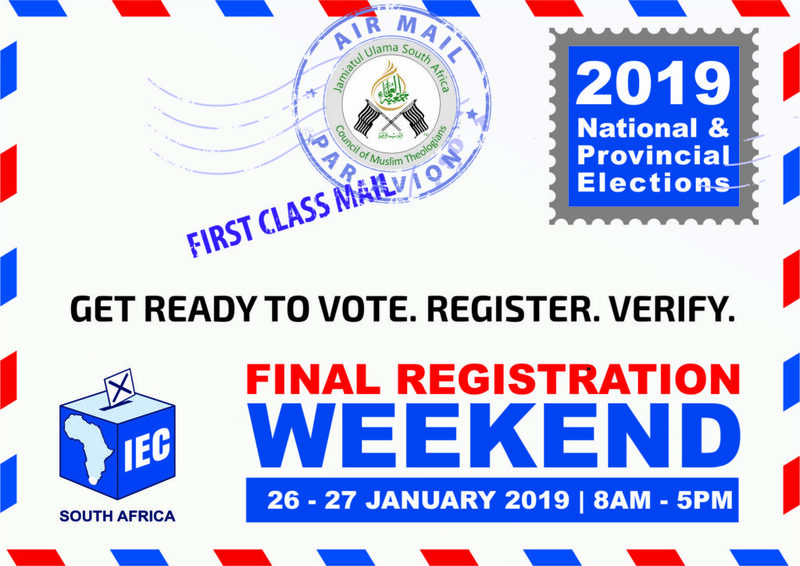 Saturday 26th and Sunday 27th January 2019 have been designated as voter registration dates. Voters, who are already registered, will have the opportunity to visit their respective voting stations in order to check their registration and specifically to confirm and update their address details. Just four months away, we are therefore once again at the cusp of the national elections and may be asking yourself, why register to vote? Government lacks credibility, politicians don’t keep their promises, and money seems to be getting in the way of everything. What difference will my vote make? Many today complain about politicians not listening to the public. Of course, if we do not bother to vote our voice will not be heard by our elected officials in the first place. Our elected representatives are guided by what we say particularly when we vote. And if we don’t vote we are telling our politicians that we don’t care what they do and that is a dangerous thing to tell them. Voting connects citizens with the political process. Voting connects us to one another as citizens. Voting helps to safeguard our freedoms. A democratic community can only survive if its citizens see participation in the political process as a duty and a responsibility. It may be asked whether by voting for a particular party we are not endorsing all their policies which are based on man-made laws (secular law). The answer is NO; this is not necessarily the case. No one should imagine that anyone who says that it is OK to vote is thereby expressing approval or support for disbelief. It is done in the interests of the Muslims, not out of love for disbelief. Our support for a party is therefore a qualified endorsement and not simply a carte blanche sanction of all that a party espouses in its election manifesto. The Muslims rejoiced when the Romans defeated the Persians, as did the Muslims in Abyssinia (Ethiopia) when the Negus defeated those who had challenged his authority. This was not in any way condoning kufr but rather looking at the long term welfare of Muslims. Participation in a non-Islamic system does not necessarily mean participation in disbelief. It depends on the nature of this participation. Vote should be given to the candidate that one believes will give people their rights, prevent oppression, and so on… If it is thought that a particular candidate or party will be of benefit to the general public in their day to day affairs, then the vote should be given to him. And by voting a particular party, it will not be considered that one agrees with all their ideologies and beliefs… At times, voting becomes necessary. Sayyiduna Abu Bakr (ra) narrates that the Messenger of Allah (saw) said: “If people see an oppressor and don’t prevent him, then it is very likely that Allah will include all of them in the punishment” (Sunan Tirmizi & Sunan Abu Dawud). The Jamiatul Ulama South Africa therefore urges all eligible voters to exercise this responsibilty, which is both a duty and a right,first by registering and/or verifying details on the voters’ roll, ahead of the polling day in May 2019, in-sha-Allah. May Allah protect the our community and bless us with leaders who subscribe to the principles of honest, justice and compassion.